TISCO Foundation: ติดตามผลทุนประกอบอาชีพ นางชนิดา หมั่นตระกูล – TISCO Foundation followed up start-up grant Mrs.Chanida Mantraku. ติดตามผลทุนประกอบอาชีพ นางชนิดา หมั่นตระกูล – TISCO Foundation followed up start-up grant Mrs.Chanida Mantraku. Let's end the month with a story of Chanida Mantrakul, a start-up grant recipient in 2015. 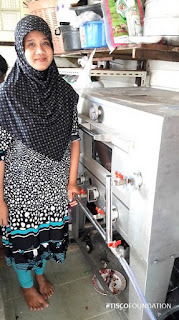 Chanida received an oven to expand her bakery business in Bankrua community, Rajathevi district, Bangkok. Now she has more variety of baking goods for her customers bringing in more incomes for her family.